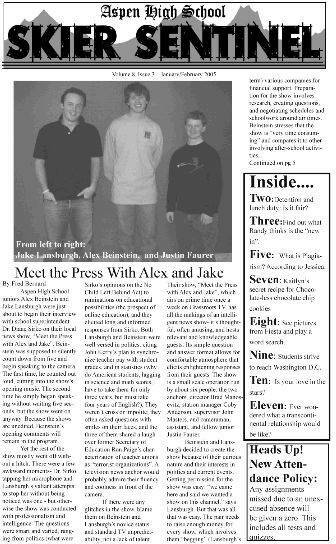 Budget cuts could silence Aspen High School's student newspaper, the Skier Sentinel. The district is in the second year of a three-year plan to eliminate a nearly $1 million deficit. An additional $140,000 in cuts will be needed in the 2006-07 school year.Other departments that will see a staff reduction include foreign language, science and the reading program, Evans said. No teachers are being fired – those who are retiring or leaving the district for other reasons are not being replaced.Their classes will be absorbed by existing teachers, Evans said, meaning a heavier workload for staff. Nancy Haddad, who helps with the school’s yearbook staff, is retiring after this year, and right now the school plans to replace her full-time position with someone working part time.”That’s what puts us into a bind,” said Dave Conarroe, the adviser for the Skier Sentinel. “When cuts are made, it’s going to have consequences. It’s not like they can just make everyone pick it up, because it’s not as easy as that.”Conarroe and Haddad handle 12 classes per day, including newspaper and yearbook, and when Haddad leaves, there will be three classes without a teacher. “It’s possible we can still do yearbook and newspaper [classes] in this department, but clearly there are some issues we have to take care of about what’s going to be taught,” Conarroe said.He said the reason a journalism curriculum exists is partially because he’s an advocate for school newspapers.”About eight years ago I told Kendall that I’d be willing to do it – prior to that it had been since the ’70s since there was a school paper,” he said. “I think journalism is important, and the kids need a voice.”Junior Fred Bernard, 17, is assistant editor of the Skier Sentinel. He said he plans to work in journalism, and while he would miss the newspaper class if it was discontinued, there are other classes where he’d get writing practice.